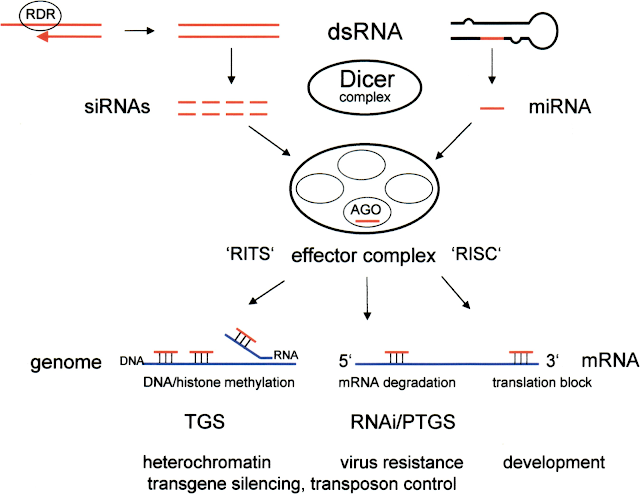 RNA interference (RNAi), discovered by Andrew Fire and Craig Mello in 1998, is essentially the use of small fragments of RNA, known as small interfering RNAs (siRNAs) to block, or interfere with, the production of specific genes. These occur naturally in mammalian cells, but can also be generated artificially and delivered into cells. Each RNA fragment has a sequence that is complementary to a part of the target gene, in that it is exactly complementary to the sequence of the gene. When it binds, it effectively blocks that part of the gene, by preventing interaction with the machinery of the cell whose job it is to translate that DNA sequence into protein. As a result, the protein is not made. Since its discovery, RNAi has been used extensively in the laboratory to research which genes are responsible for what functions. By blocking a gene, and observing the effect it has on a cell or organism, the function on that gene can be deduced. Prior to RNAi, this kind of research was only possible using laborious and expensive gene knockout techniques. The ability to switch on or off specific genes on demand has important implications for the treatment of genetic disorders. For example, some genetic disorders are caused by the over-production of certain proteins, while others, such as cancer, are caused by genetic mutations that are not inherited. By using RNAi sequences that are specific to the gene that codes for the wrongly-expressed protein, its production can be significantly reduced, potentially even to normal levels (1). Naturally produced RNAi, especially in lower organisms, is very important in the defense against viruses, and acts by blocking the RNA that is the viral genetic code as soon as it enters the cell. Similarly, siRNAs can be generated against human viruses such as HIV, and therapies are currently being developed for this infection as well as hepatitis B and C amongst others. However, there are a number of hurdles that must be overcome before RNAi can be used routinely as a therapeutic agent for disease in humans. One of the main problems with RNAi is the problem of delivery to the correct cells, especially to those tissues deep in the body. Delivery to deeper tissues is hampered by the body’s defense system, including nucleases that degrade nucleic acids (DNA and RNA) (2,3). There are few organs that are easily accessible to RNAi, including the eye and the respiratory tract. In both these cases, RNAi can be delivered via saline solution to result in effective knockdown of the target genes. Indeed, one of the first conditions to be investigated for RNAi therapy was age-related macular degeneration. siRNAs can also be delivered systemically via intravenous injection using liposomal particles to aid uptake into the cells. This may be effective for delivery to the liver and jejunum, but is not appropriate for other organs (2). Viruses are perfectly designed to rapidly and efficiently invade cells, and infect them with their own genetic material, RNA. By replacing viral RNA with the RNAi sequence, the virus is able to deliver the ‘drug’ directly to the cell in which it is needed. Additional barriers to the use of RNAi therapy in humans include safety and tolerability issues, tissue-specific targeting and duration of effect, and research is ongoing into identifying ways in which these barriers may be overcome. Resolution of these issues could ensure that RNAi becomes the mainstay of treatment of genetic diseases.